Cyber Management Alliance is a UK registered cyber security training provider and trusted advisor to private and public sector organisations. 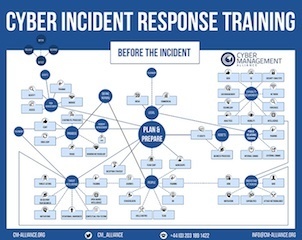 Cyber Management Alliance (CM-Alliance) provides our clients with a broad portfolio of strategic and operational cyber security services including the GCHQ-Certified Cyber Incident Planning & Response(CIPR) Breach Readiness Program. To be compliant with new breach regulations like the GDPR by increasing their cyber resiliency posture and reducing their risk exposure. By supporting, developing and assisting management in ensuring that the business can swiftly respond to and resume its operations during and after a cyber attack. To embrace a best-practice, standards based approach to managing (monitoring, detecting, responding, containing) a cyber attack. Throughout this program, we work with all stakeholders in the business to create and adopt a set of strategies, policies and technologies to ensure that the organisation is aligned and compliant with the GDPR’s breach notification requirements. By including a Cyber Incident Response Plan in your GDPR preparation roadmap, it will demonstrate to the regulators that you have the policies, procedures and planning in place to swiftly respond to a data breach or cyber attack. This two day workshopp will enable you to prepare a defined and managed approach when responding to a data breach or cyber attack of an information asset. The content is intended for senior management and business executives who wish to gain a better understanding of incident response or who are responsible for helping organisations plan and prepare for potential cyber threats, and effectively deal with actual cyber attacks. This is not a technical course therefore there are no prerequisites. Government / Public Sector: Warwickshire Police, West Mercia, West Yorkshire Police, South Yorkshire Police, North Yorkshire and Humberside Police. Industrial: Emirates Aluminium, Kuwait Petroleum, CB & I. "Excellent workshop with a lot of good hints, not only for security staff, but also for management in order to understand the nature of attacks and the mitigation of vulnerabilities in order to reduce the impact during an incident. Thank you for this excellent workshop. The expectation was exceeded, especially the examples from incidents and hits."